Traditional Linseed oil based drench designed as a mild laxative for horses. 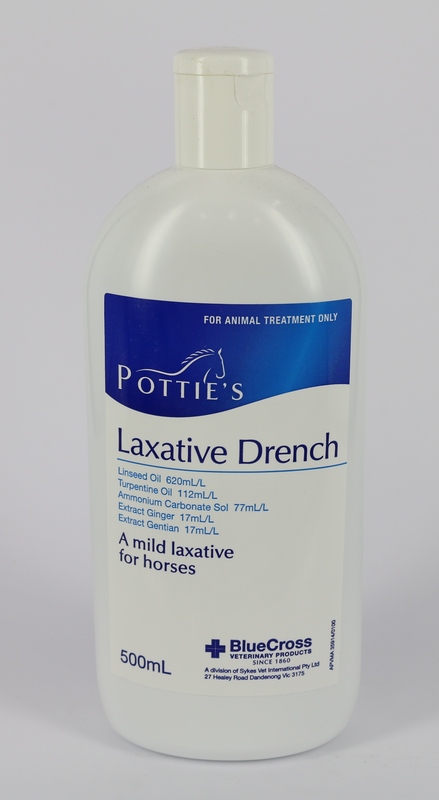 ***Pottie’s Laxative Drench should be used by or under the direction of a registered Veterinary Surgeon. When should I use Pottie’s Laxative Drench? Pottie’s Laxative Drench should be used when your horse is showing signs of constipation, bloat, intestinal impactions (colic) or general abdominal discomfort. Pottie’s Laxative Drench can also be used anytime to brighten up a horse, which is out of sorts, listless, and has a dull coat. The balanced quantities of proven ingredients combine to help restore digestive function and lift general health and performance. How do I use Pottie’s Laxative Drench? Pottie’s Laxative Drench should be given by mouth with a drenching bit or stomach tube, using normal precautions to avoid inhalation while dosing. The horse should be rested for 48 hours after drenching.